First attempt at a library. Lots more changes and fixes to do. Contributions are welcome. This gets called when custom parameters have been set AND a connection has been established. Use it to set a flag, so when all the configuration finishes, you can save the extra parameters somewhere. If you would rather start the configuration portal on demand rather than automatically on a failed connection attempt, then this is for you. Instead of calling autoConnect() which does all the connecting and failover configuration portal setup for you, you need to use startConfigPortal(). Do not use BOTH. 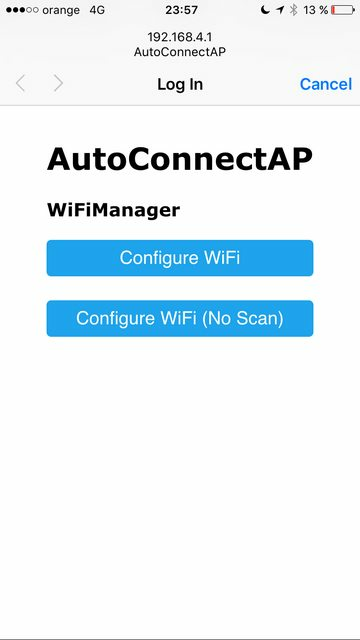 - once WiFiManager returns control to your application, read and save the new values using the `WiFiManagerParameter` object. This feature is a lot more involved than all the others, so here are some examples to fully show how it is done. You should also take a look at adding custom HTML to your form. This will make use the specified IP configuration instead of using DHCP in station mode. There are a couple of examples in the examples folder that show you how to set a static IP and even how to configure it through the web configuration portal. You can filter networks based on signal quality and show/hide duplicate networks. You can also remove or show duplicate networks (default is remove). 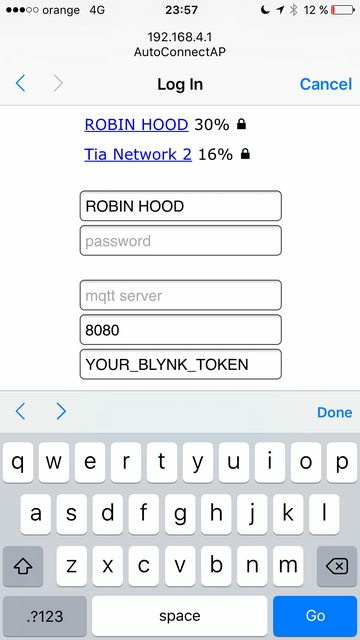 Use this function to show (or hide) all networks. If you get compilation errors, more often than not, you may need to install a newer version of the ESP8266 core for Arduino. I am trying to keep releases working with release versions of the core, so they can be installed through boards manager, but if you checkout the latest version directly from github, sometimes, the library will only work if you update the ESP8266 core to the latest version because I am using some newly added function. 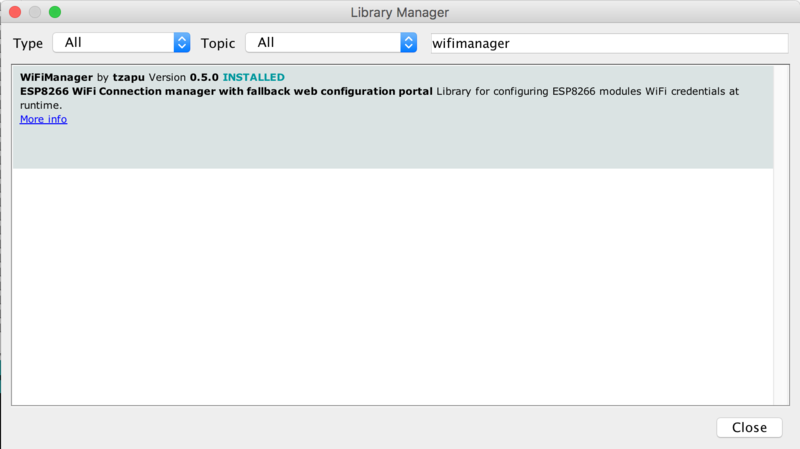 If you connect to the created configuration Access Point but the configuration portal does not show up, just open a browser and type in the IP of the web portal, by default 192.168.4.1. If trying to connect ends up in an endless loop, try to add setConnectTimeout(60) before autoConnect();. The parameter is timeout to try connecting in seconds. works with the staging release ver. 1.6.5-1044-g170995a, built on Aug 10, 2015 of the ESP8266 Arduino library. The support and help I got from the community has been nothing short of phenomenal. I can’t thank you guys enough. This is my first real attept in developing open source stuff and I must say, now I understand why people are so dedicated to it, it is because of all the wonderful people involved.